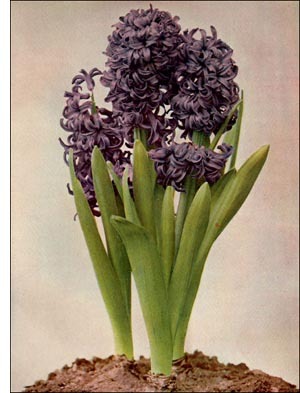 Hyacinth, also called Jacinth, is said to be "supreme amongst the flowers of spring". It was in cultivation before 1597, and is therefore not a new favorite. Gerard, at the above date, records the existence of six varieties. Rea, in 1676, mentions several single and double varieties as being then in English gardens, and Justice, in 1754, describes upwards of fifty single-flowered varieties, and nearly one hundred double-flowered ones, as a selection of the best from the catalogues of two then celebrated Dutch growers. One of the Dutch sorts, called La Reine de Femmes, is said to have produced from thirty-four to thirty-eight flowers in a spike, and on its first appearance to have sold for fifty guilders a bulb. Others sold for even larger sums. Justice relates that he himself raised several very valuable double-flowered kinds from seeds, which many of the sorts he describes are noted for producing freely. It is said that the original of the cultivated hyacinth (Hyacinthus orientalis) is by comparison an insignificant plant, bearing on a spike only a few small, narrow-lobed, wash-blue flowers. So great has been the improvement effected by the florists that the modern hyacinth would hardly be recognized as the descendant of the type above referred to, the spikes being long and dense, composed of a large number of flowers; the spikes not infrequently measure six or seven inches in length and from seven to nine inches in circumference, with the flowers closely set on from bottom to top. Of late years much improvement has been effected in the size of the individual flowers and the breadth of their recurving lobes, as well as in securing increased brilliancy and depth of color. The names of hyacinths are now almost legion, and of all colors-carmine red, dark blue, lilac-pink, bluish-white, indigo blue, silvery-pink, rose, yellow, snow white, azure blue.